Lindsay is a dedicated and invaluable volunteer for Impact NW’s AKA Science (All Kids Are Scientists) program. Lindsay received her award in a ceremony that took place on Oct. 12, 2015 in Salem, Oregon. The awards ceremony was hosted by Oregon Volunteers and is designed to recognize individuals and organizations for their dedication and determination in promoting volunteerism in Oregon in each region and statewide. “I am so pleased to win the Governor’s Volunteer State-Level award. Kim Menig, Tyler Oshiro, Nicole Howe, and everyone else working with AKA Science are so passionate for the project, and it’s inspiring to work with them,” said Lindsay. Lindsay has been a devoted and invaluable volunteer for Impact NW’s AKA Science program, volunteering over 365 hours, all while taking public transportation between Clackamas and Portland locations. Lindsay’s greatest contribution has been her skillful crafting of clear, kid-friendly scientific explanations for AKA Science activities which have been integrated as a “What’s Going On?” section following each activity in the curriculum. “I know from my own education that hands-on science experiments are a great way to increase science literacy and prepare kids for a lifetime of learning and exploration. Science isn’t some scary thing that only ‘smart people’ can do, it’s something all kids can do,” said Lindsay. Lindsay has also provided vital assistance with: testing science activities for quality and safety, reviewing and synthesizing instructor comments, researching replacement activities to strengthen curriculum, writing and editing portions of curriculum, filming web tutorials to demonstrate how to facilitate activities and identifying linkages with Next Generation Science Standards. She does all of this with incredible positivity and contagious enthusiasm. 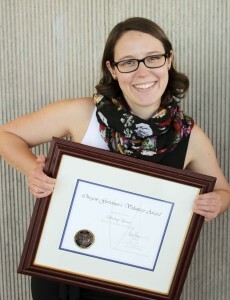 Thank you, Lindsay, for all you do to support our AKA Science program and congratulations on this well-deserved award!